The Columbia Mountain Running Session. 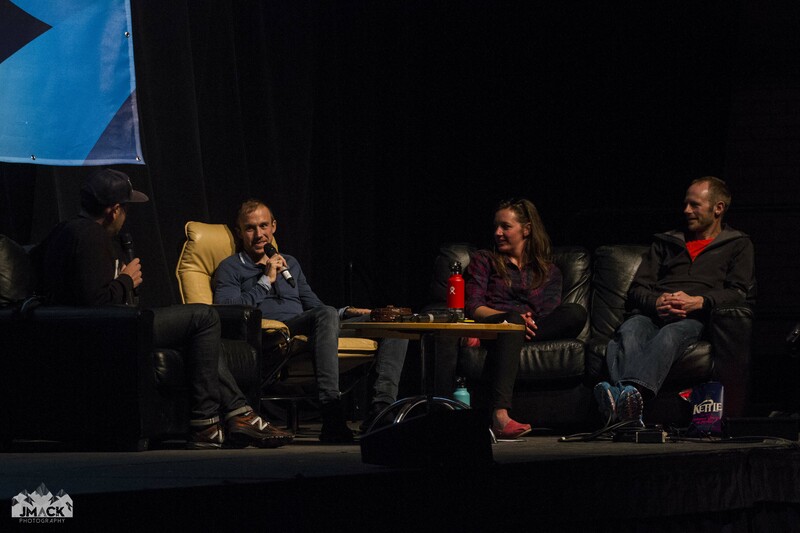 From trail to ultra, adventure to just starting out, the Mountain Running session incorporates all disciplines and abilities of the sport, delivering a broad and diverse speaker panel, who’s expertise range from half marathon to 100 miles, multi day, self supported adventures and beyond. Simon Freeman, co-founder of Like the Wind Magazine, was our host for the evening, one of the most passionate people you will meet when it comes to running and more over, the stories it creates. Sharing these stories is the reason Like the Wind Mag exists and it was fitting to have Simon as Parky. The audience were shown a number of photos submitted from some of the best photographers in the world, which personified why the magazine exists and set the theme for the session. A contender for the most featured man on this website, Damian has had a year to remember, with his podium performance at UTMB, realising a dream he has pursued for years and surprising himself in the process, taking 5th this year. It should also be announced, at the time of writing, UNDERDOG, the film from Summit Fever Media, which follows him on his build up and race to 5th place, won Kendal Mountain Festival’s Peoples Choice Award. To put the cherry on an ever growing cake, it was his 43rd (sorry Damian) birthday on Saturday! An outdoor journalist, Damian is relatively new to competitive running, after a hiatus of some 20+ years following not making a district or county XC team at school and opting for football instead. To provide some perspective, in 2011 he ran his first half marathon, 2012, first marathon and ultra, and in the following 6 years has represented Great Britain at the Trail Running World Championships, has 4 UTMB finishes to his name, a 2.38 marathon PB, podium on the Spine Race and more. Success, moreover, dedication to the sport has been condensed into a relatively short time frame, but what stands out for me is consistency. UMTB being the prime example, 4/4 finishes, each climbing higher up the finisher roster, culminating in the 5th place this year. “To me it’s about having adventure, be it your races or your training runs” Damian is the first to say his obsession may well be an addiction, but one of the better ones to have. The first half marathon wasn’t planned or measured out, his brother had run 1:46, so that is what he went for – “Remember running past a group of kids with jelly babies, smashed it out of their hands“. With a background in long distance walking, on top of football, being on feet for extended periods of time was already part of Damian’s skill set. In may ways ultra races are similar to long walks, you walk up hills after all. No stranger to the race, it’s atmosphere, the training and time dedicated to racing at the sharp end of what has rapidly grown to be the most competitive ultra out there, Simon asked what things stood out for Damian. The crowds – you have people supporting you on the sides of mountains in the early hours, the entire town celebrates. When asked about what Damian can attributhis success at UTMB to – “Much of my success is due to finding someone who can train bumble bees” – a reference to Kilian Jornet being stung prior to the race, which induced an allergic reaction, resulting in his withdrawal from UTMB. I stuck my neck out and called out Damian to be the Andy Kirkpatrick of running… I still hold onto this for Damian’s whit, ability to tell a story and humour. Jenny Tough is an adventurer and racing, with a ever increasing list of world firsts to her name. Coming to Kendal after recently setting an FKT traversing the Bolivian Andes, in terms of long distance, Jenny was far ahead of the the other speakers for time, complexity and remoteness of her endurance feats in mountains. Jenny openly admitted she started running for negative reasons, because she hated her own body at the time. However, this has lead to positivity and a series of adventures that inspire many. With the same question posed to Damian, it was the people you meet along the way, in a low situation, it sounds cliche “it makes you feel better about the world”. Given the remoteness of many of Jenny’s adventures, Simon asked a question on the lips of any of the audience, how do they respond when they see you? “Like you are bonkers. A Gringo has landed, is someone chasing her?” You are doing something weird they haven’t seen before, what on earth are you doing and yet, all they want to do is help. In Bolivia, Jenny was told again and again she would be murdered before she traveled out, you’re just a girl running in the mountains. “After weeks alone in the mountains, you come to Kendal and every wants to know your route. The contrast couldn’t be bolder.” Why put yourself at risk? Jon Albon may be the silent assassin of mountain running. Despite being one of the most successful OCR and mountain running racers of the past few years, he manages to stay under the radar of most and carve his own path. A career that started with Roller Hockey, he found OCR (Obstacle Course Racing) advertised in a newspaper article. After completing his first race, Jon enjoyed the fact it wasn’t just running. OCR requires rounded fitness and there is no formula to success. As the sport evolves, so do training techniques, theories and the athletes at the top of the sport. As is often the case of those that stick with a sport, Jon kept entering and winning. So much so, he became World Champion. Fundamentally it relies on Caveman fitness, you need to be strong, fast and tough. At the same time you are being exposed to your fears – fire, ice, dark, confined spaces and even electrocution. One of the few who can say they beat Kilian, and possibly the only one to say he beat him at his own race, Jon is at the very top of the sport, but may rival Damian for humbleness. A two time Extreme Skyrunning World Series winner and current Ultra Skyrunning World Champion, technical terrain features highly on Jon’s racing, utilising skills from OCR. Damian – “love the terrain, a bit short,” “Need a long race, fast guys can blow up & then I can run past”. Whereas many may hang up their shoes, Eoin is relishing the opportunities it brings. “A new age category spurs me on,” an “insurance policy to win your age group.” Yet, he will always race the entire field and it is his older friends that inspire. Officially finished 1 lap on his last attempt, overtime on the second lap, breaking his collar bone in the process. Why would you go to a race where the number is 0 who finished? Sports coach, international mountain leader, Nordic walking, canoeing, rock climbing, & mtb qualifications, Julia has a professional skill base developed for the mountains. To top this off, a 4th place finish at CCC. On the subject of coaches, Simon asked the panel for their experiences. Find kindered spirits – someone who has the same passion – run with others – set yourself a couple of goals. Short term and long term. It Might be your goal is 5-10 years down the line. Above all, get some skills. Where do you see yourself in 10 years times? Jon will you do a Bob Graham Round & smash Kilian’s time? “I purposely haven’t run any of the legs” and went on to say he’d like do it on his own, carrying all his kit, unsupported. The Mountain Running Session was a great couple of hours, expertly lead and crafted by Simon Freeman, who gradually added to the panel, incorporating every member and utilising their different skills and experiences, to provide answers which informed and entertained. With audience participation encouraged throughout, this was a session for those who want to engage, learn and laugh. A big shout out to Paul Scully for inviting me along.